PBI-Gordon Corp. introduced Pedigree Fungicide SC. The product is marketed through a partnership with Nichino America and will be available for sale in 2019. The product is specifically formulated to provide disease control on golf courses, residential and commercial properties and sports fields. Featuring a proprietary formulation and the active ingredient flutolanil, it’s applied as a preventive treatment and can stop several stages in the disease life-cycle, including spore germination. Professionals can expect protection over a period of seven to 28 days, depending on the level of disease pressure. A flowable suspension concentrate, Pedigree has shown safe and consistent performance on creeping bentgrass, Kentucky bluegrass, annual bluegrass, annual and perennial ryegrass, red fescue, tall fescue, Bermudagrass, zoysiagrass and St. Augustine grass, the company said. 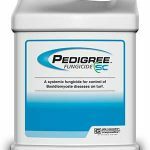 Pedigree provides treatment of turf diseases such as brown patch, fairy ring, leaf and sheath spot, large patch, red thread, pink patch, yellow patch, southern blight and gray snow mold.